Great tasting Cheapest Custom Printed Natural Springwater with a custom full colour label to make your brand stand out on this great conference or event giveaway. Our Customised Spring Water is sourced from our local natural mountain spring water in Queensland and bottles fresh ready to enjoy. Choose from 300ml & 600ml bottles with refreshing great tasting pure spring water and we will customise your Personalised Spring Water with a full colour label. Why Choose Our Custom Labelled Spring Water? 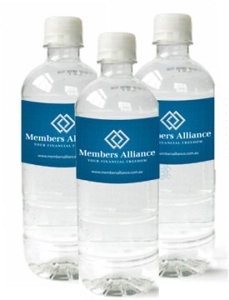 Our spring water is a great conference promotional item freshly bottled natural Australian Spring water with high quality full colour labels and can be accompanied by either NOTE PADS, MINTS or PROMOTIONAL PENS which gives a complete branding experience to the end user. Call us on our free call number 1800 833 006 for your next order. We supply all of Australia including Brisbane, Sydney, Melbourne, Canberra, Hobart, Gold Coast, Adelaide, Darwin and Perth. 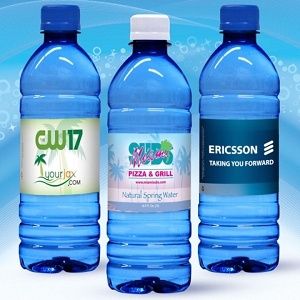 "Hydrate with our Customised Spring Water.....you logo will look cool!"